We here at Sparksoft are committed to providing quality service, which means continuously improving our techniques, and upgrading our methods to the next level. With this in mind, we want to share our news: we have recently been awarded under SPARC, a multi-billion dollar, 10 year IDIQ contract and we have achieved ISO 27001:2013 for Provision of Software Development, Maintenance and Support Services. SPARC, or the Strategic Partners Acquisition Readiness Contract, will provide support for the Centers for Medicare and Medicaid Services (CMS) Information Technology (IT) Modernization Program and initiatives. Under this contract Sparksoft is recognized as a high-quality industry partner, with the ability to offer agile, waterfall, and hybrid methodology. SPARC covers a wide range of tasks including the planning, design, development, testing, implementation, operations coordination, and maintenance for CMS’ automated systems and business application software that integrate hardware, software, and communication technologies. Our achievement of ISO 27001:2013 is just as significant. ISO 27001 is an internationally recognized information security management standard which ensures organizations can apply a framework to business processes to help identify, manage and reduce risks to information security. ISO 27001:2013 considers not only IT, but all business operations; this achievement demonstrates that Sparksoft has the capability to provide a wide variety of support. In the past, large businesses sought accreditation levels to enter the enterprise market, yet today the same assurances are increasingly sought by organizations of any size to manage risks within the business and secure the information it relies on to perform. We at Sparksoft always strive to provide the highest quality of support, while managing risks and securing sensitive information for our clients. 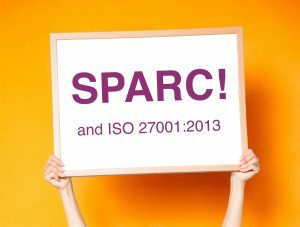 We look forward to the many opportunities the ISO 27001:2013 achievement and the SPARC award will open, and will continue to focus on innovative and optimized processes to push for better IT solutions. Thank you, and stay tuned for our next milestone!